AC/DC could be about to announce their retirement, Australian media reports have suggested. It’s thought mainman Malcolm Young has decided to end his career as a result of a long illness, and that the band have decided not to continue without him. The rumours fly in the face of singer Brian Johnson’s statement in February that they were returning to action this year to mark their 40th anniversary. And another unconfirmed report says recording studio time has been booked for May and June. 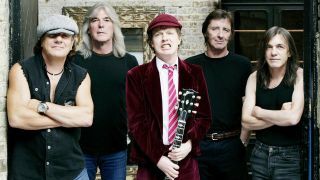 Peter Ford, entertainment correspondent with Australian radio station 3AW, says: “The suggestion being put to me is that tour will not happen – and we will never see AC/DC perform again or record again. “The boys have a pact that they will not get anyone else in the group. Nobody will be replaced. When somebody leaves the group ends. Johnson recently broke AC/DC’s silence when he said they were preparing to play 40 shows to celebrate the landmark year. He reported: “We’ve been denying anything because we weren’t sure. One of our boys was pretty ill so we didn’t like to say anything. Meanwhile, The Australian has said that the band have booked a Canadian recording studio for six weeks starting on May 1, with a view to tracking the follow-up to 2008’s Black Ice. A press conference is expected tomorrow.